When you talk about George Bush, say what you want, the World Trade Center came down during his time. This simple declarative statement was like the shot heard ’round the world, as Trump opponents and the media (that may be something of a redundancy) leaped to the claim that Trump “blamed Bush for 9/11.” Now The Cable Gamer is no supporter of Mr. Trump and never will be, but she did learn English in grade school and understands the meaning of words. And to say something happened during Bush’s term does not equal “blaming Bush” for it. The purposeful misconstruing of someone’s words is a transparent trick taught in Political Hackery 101, yet because people are blinded by loyalties it seems to work every time. (The treatment of recent remarks by Rep. Kevin McCarthy is another example.) And so an order was placed for several days’ worth of recriminations and heated chatter, and it was served up on your favorite cable channel. The beauty of this sort of faux controversy is that it can easily be reversed when the situation demands it. So while Maddow can feign astonishment at how Trump “blamed Bush” for 9/11, what happened when Dana Perino said something like what Jeb said about Bush 43 keeping us safe? Media Matters pounced, and eventually showed up on their affiliate network with Lawrence O’Donnell to reinforce their print attacks on Ms. Perino. This MSNBC door swings both ways: it can hit Trumpites and anti-Trumpites alike! Of course the elephant in the room that MSNBC avoids is their own history in “blaming Bush” for 9/11. Unlike Trump, who said he is not blaming Bush for 9/11, MSNBC actually “went there,” repeatedly. And we’re not just talking about Touré and his insistence that a missile hit the Pentagon. We’re referring to Lawrence O’Donnell, who said George W. Bush “invited” the 9/11 attacks. Lawrence O’Donnell still has his nightly prime time MSNBC show. And we’re talking Keith Olbermann, comparer of the Bush administration to the Third Reich, who not only blamed George W. Bush for 9/11, but developed his own intricate conspiracy theory: Bush created and announced nonexistent terror threats to increase Republican turnout in elections. It was a smash on extremist websites like Prison Planet as well as the usual suspects among the far-left. This screed, frequently repeated and updated, was replayed during other programs, both opinion shows and ostensible “news” hours. Its perverse lunacy remains unrivaled in the annals of cable news nuttery. 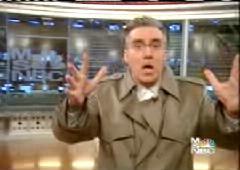 Unlike O’Donnell, Keith Olbermann does not still have his nightly prime time MSNBC show. But wouldn’t you know it, MSNBC may be trying to get him back. And just when Jeb Bush is running for President! It seems like a remarkable coincidence, but just as there is no crying in baseball, there are no coincidences in The Cable Game. To be fair, let’s not ignore the Bloomberg interviewer (of Trump), Jason Riley (WSJ) on FNC’s Special Report, Juan Williams on Special Report, Bill O’Reilly and his guest Charles Krauthammer. All of them seemed to question either the appropriateness, or the relevance, of Donald Trump’s comment about George W. Bush and 9/11. That’s a fair, and smart point. I think for whatever reason a meme developed quickly that Trump’s original comments were his way of “blaming Bush,” and that became almost a universal interpretation. I still think that characterization went beyond his actual words. Still, in the short time since I pressed “publish” on this post, Trump has managed to take it further, whether that was his plan all along or not. To be fair, the argument is that Trump is using a liberal argument about Bush and 9/11. Nobody is pretending liberals never said anything like this, on MSNBC or anywhere else. The whole point of this thing is that the GOP frontrunner is using a liberal talking point against his own party. Chris Matthews approved this (Trumps) message. There was a debate on All In with Chris Hayes last night in which the liberal on the panel was arguing Trump’s point against the conservative. We’ve always had liberals questioning Bush’s actions before 9/11, as well as conservatives questioning Bill Clinton’s. What’s new is a presidential candidate going after his own party.